One of the most exciting and fun dining and drinking places, right in the centre of Beckenham. La Rascasse is the perfect venue for simply a glass of wine, a light snack or a full meal from our thoughtfully selected International menu featuring Irish Oysters, Half Pint of Prawns or the amazing Fish Platter to satisfy the heartiest of appetites. Our daily specials offer an appetizing alternative to the a la carte menu. 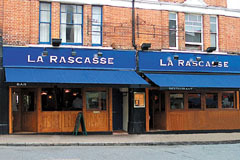 La Rascasse, with its Continental atmosphere, is the ideal location for your private or office party. A private bar area can be hired which is ideal for birthday parties or special celebrations. Finger buffets start from �5 per head. Live music is featured regularly ranging from Frank Sinatra to Tom Jones evenings. If you're looking for atmosphere - then La Rascasse has it! Open Mon-Sat midday-midnight, Sun midday-10.30pm. All major credit cards accepted. 10% service charge. Daily chef specials and fresh seafood. Fine wines and champagne.